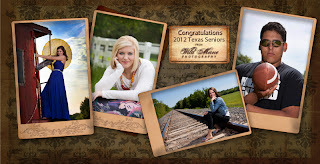 Wild Mane Photography's Blog: Texas graduation celebrations are in the air! Texas graduation celebrations are in the air! This time of year is always exciting, happy and sad all at the same time. How I love working with North Texas high school seniors! They are fun to spend time with and to photograph, and they can and will pose when I ask them. Sometimes they are such naturals that they pose before I even ask. Not that I don't enjoy photographing babies and young children but they are never so full of interest in being photographed! So, as I am completing orders for the 2012 seniors, I look at each of them and feel blessed that they came into my life. They are about to step out into a new world with joy, trepidation and anticipation as they leave family and friends behind. I watch their Moms and Dads at the proofing sessions show their pride, love and a tiny bit of sadness as they know the time is upon them to let go of their beloved children and send them off as young adults. They have taught them and loved them, worried about them and prepared them for this moment. It feels like a blink of an eye instead of 18 years. That is why I am a photographer! That "blink of an eye" can be captured for each and every one of us and our families. We can't go back in time but we can still look at each and every memory and hold it in our hands when we have had photographs taken along the way.